The seeds of Lincoln’s Southern Hospitality were planted in 2002 during a career fair. “It was a bold statement coming from a college student who hadn’t gotten his degree yet but I grew up with it,” Jones said. Years later, Jones and his wife Jennifer own Southern Hospitality, the company responsible for bringing Raising Cane’s to Lincoln. The two operate five locations in Lincoln and Grand Island and celebrated their 10-year-anniversary this month. The couple attended Louisiana State University soon after Raising Cane’s first opened. Justin learned he couldn’t own a Raising Cane’s yet, but was brought on as a manager from May 2003 to April 2006. Though Justin’s main duties were managing districts and opening Raising Cane’s in new locations, his priorities shifted once Hurricane Katrina hit Louisiana. Justin became responsible for shuttling product and people down to New Orleans from Baton Rouge once they were able to commute. After Hurricane Katrina, Todd Graves, the founder of Raising Cane's, called Justin into his office and asked if he was still interested in owning a Raising Cane's. "I didn’t even ask Jennifer, I just called her and said 'Hey, we’re gonna own a Raising Cane’s,'" Justin said. Jennifer said she remembers Justin calling and asking what he thought of Lincoln, Nebraska. She proceeded to pull out a map. The two visited Lincoln in April of 2006 to get a feel for the city and decided to take the plunge. "We were a young, married couple and we decided to take a chance and now we’re here," Jennifer said. By July 2006, the first Raising Cane's location opened in Lincoln. The downtown location would open six years later in November 2012. 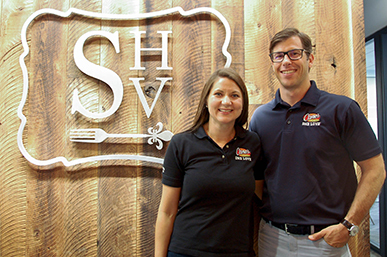 With new restaurants opening up and their employee list growing, Justin and Jennifer decided to find a new, large and open space that could accomodate their growth. They decided to anchor Southern Hospitality at a newly remodeled space near the capitol building, 1220 Lincoln Mall. Jennifer said their new offices are a far cry from their first space. "Justin and I’s first office started in the basement of our house," Jennifer said. "It wasn’t even a finished basement, it was not a happy space. From there we moved into another building and it was a two-office with a little [space for an office in the open room]. We outgrew that one and we moved to our previous location. As we open more restaurants, we’re able to grow our company and our vision and mission." 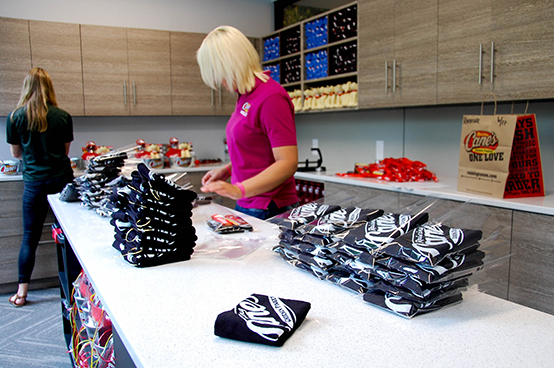 Since opening in Lincoln, Jennifer said Southern Hospitality has given back over a million dollars to the community, something the company plans on continuing.